We had a great weekend full of mommy daughter bonding while daddy was in Vegas playing with friends. Now we are back to our routine this week. Here is the plan for meals this week. Kind of an easy week. Mostly because I went shopping before I planned - so I had to go simple. 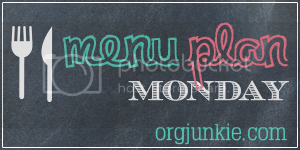 More menu plans over at Org Junkie, of course!